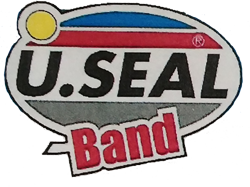 USeal Band is a versatile, self adhesive 60mil membrane, consisting of a rubberized asphalt compound, covered by a patented Aluminum or Copper Foil reinforced with a polyester film. The adhesive compound is protected, until use, by a silicone release film. 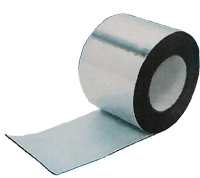 USeal Band is a labor saving, cost effect, easy and fast to apply solution fo roof waterproofing. USeal Band can be used to protect, repair; seal and flash parapets, glass, metal and plastic windows frames, skylights, doors and any other opening, asphalt, brickworks, concrete, clay and cement roof tiles, drywalls, OSB, plywood, metal and plastic material on roofs and coverings in general, gutters, metal tubes and pipes, plastics such as fiberglass, polyethylene, ploypropylene, polycarbonate and some PVC types. It is available in many reinforced metal finishes: Bright Aluminum, Lead color Aluminum, White color Aluminum, Embossed Aluminum, Terracotta color Aluminum, Red color Aluminum, Natural copper and many others.